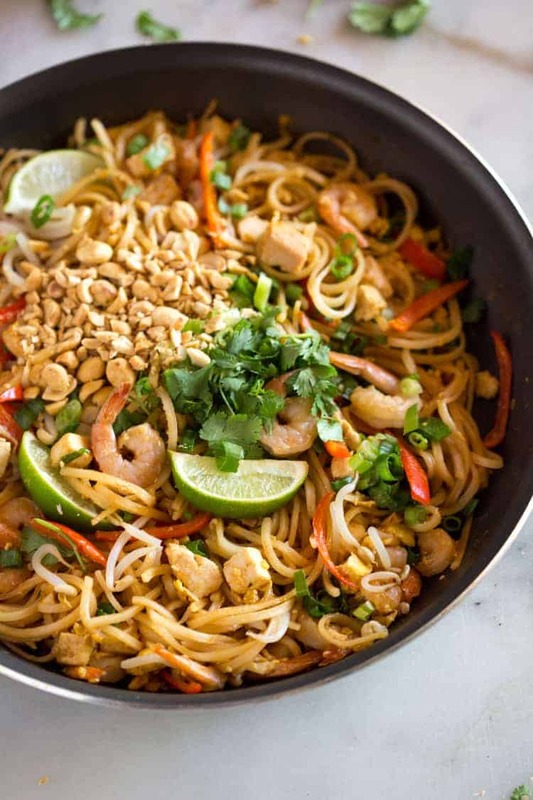 You can make amazing restaurant-quality Pad Thai from home, in under 30 minutes! It’s everyone’s favorite Thai dish and it’s packed with fresh ingredients and a simple homemade pad thai sauce you will love. Hi everyone! It’s Lauren, back from Tastes Better from Scratch, here to share my love of Thai food! When I get to choose a restaurant for date-night, 9 out of 10 times I’ll pick a Thai food restaurant. I love the bold flavors and all of the options, from curry to pad thai. I also LOVE to make Thai food from home because most of the dishes are really simple, and it’s fun to mix up the dinner routine! 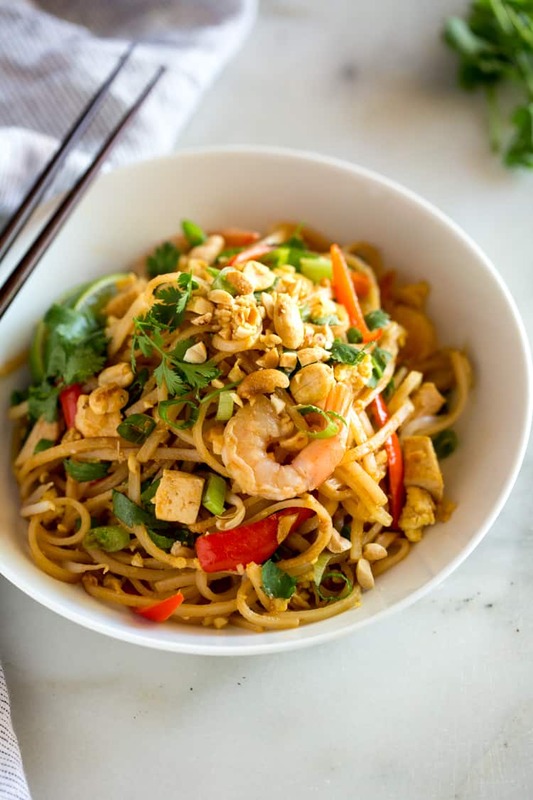 Pad Thai is a Thai stir-fry dish made with rice noodles, shrimp, chicken, or tofu, peanuts, scrambled egg and bean sprouts. The ingredients are sautéed together in a wok and tossed in a delicious pad thai sauce. Traditional pad thai recipes call for tamarind paste but since it’s not easily found at your local grocery store, I substituted for ingredients most people have. However, if you would like to use tamarind paste to make the sauce authentic, substitute about 2 Tablespoons in place of the rice vinegar in this recipe. How do you make Pad Thai? Cook or soak the rice noodles, according to the instructions on your package, until they are tender. 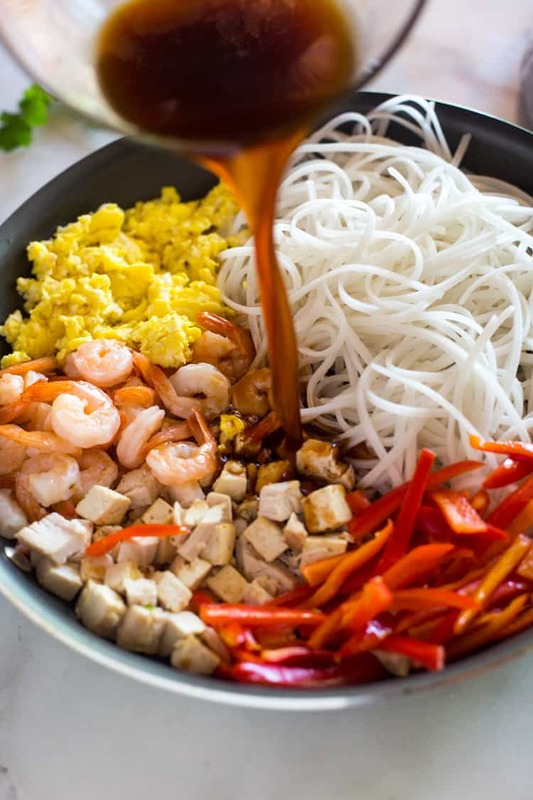 Make the Pad Thai sauce by combining the fish sauce, soy sauce, rice vinegar, brown sugar, sriracha and peanut butter. Stir fry the chicken, shrimp, tofu, bell peppers and scrambled eggs. Add the noodles, sauce and bean sprouts to the pan and toss everything to combine. Top with peanuts, green onion, cilantro and limes. Cook or soak rice noodles according to package instructions, until tender. Top with green onions, extra peanuts, cilantro and lime wedges. Seve immediately! Thanks for the recipe. Looks scrumptious. I’m a new cook (wannabe) this looks like something I can do. If Wifey hasn’t already planned supper for tonight I’ll try this. Again thanks. I love love love Thai food! And Pad Thai is one of the first I ever fell in love with and it’s no wonder! Your recipe looks easy enough but so tasty. Thanks for sharing! When I saw this recipe come into the mailbox this week I knew I had to try it. I emailed it to my 19 yr old daughter, and we couldn’t wait. Tonight was the night. We love Pad Thai and love finding new Thai food restaurants to try it. Making this recipe was easy, relatively quick and fun. When my husband and 16 yr old son got home it was almost done. The house smelled great. I used one pound of large shrimp instead of chicken. Eight ounces of meat is NOT enough for the four of us. I would recommend a full pound of chicken breast too. I left out the cilantro, but did everything else according to the recipe and it was great. We all loved the flavors and I will forward the recipe to my ‘gourmet chef’ friends! Can’t wait to make it again for company. We made this last night and it was AWESOME!I I highly recommend the peanut butter in the sauce. I can’t wait to make this again for some friends who love Thai food. I’m not gonna lie, fish sauce doesn’t sound good. I like be pad tai but I’ve never had any that taste fishy…. could I just leave out the fish sauce or substitute it with something? HAHA! I totally understand. Yes, that sounds good. I found tamarind paste. Does it only replace the rice vinegar, or maybe some sugar, too? I have not tried tamarind paste with this pad Thai. Let me know what you think!